When learning or buying a new element please check the cost and training requirement below. 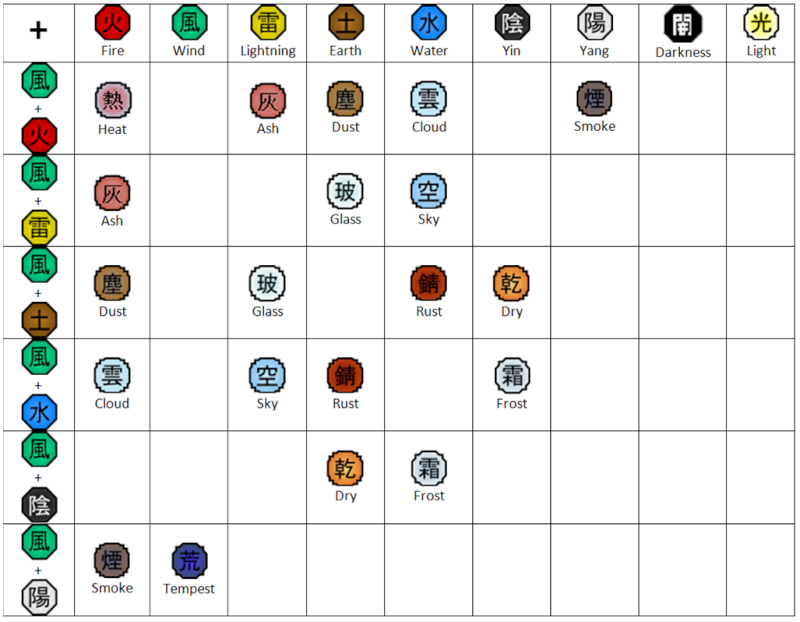 Clan elements are basically your bloodline elements. 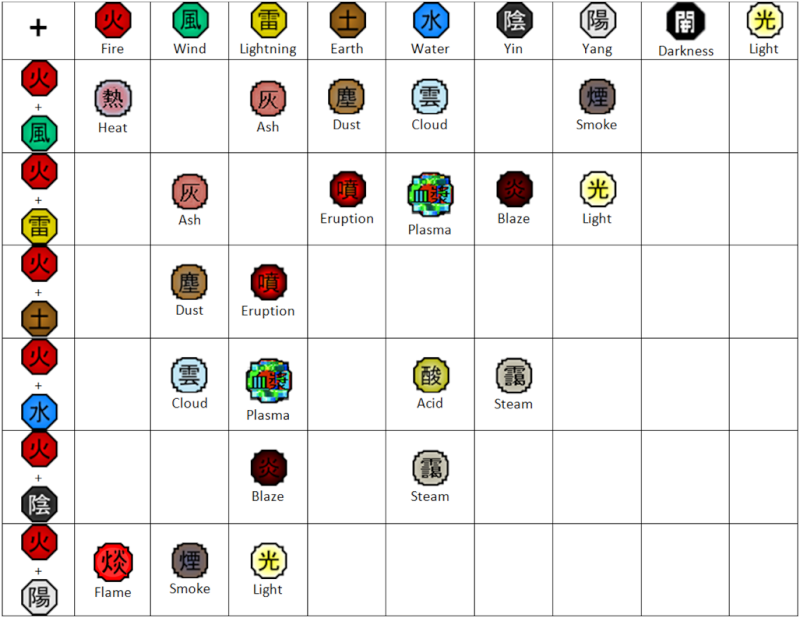 These are the elements given to you at birth in which if your a Genin may start with as long as your beginning single basic element helps make that clan element. If you have the Ice bloodline and you are a Genin you MUST start with either the water or wind element. 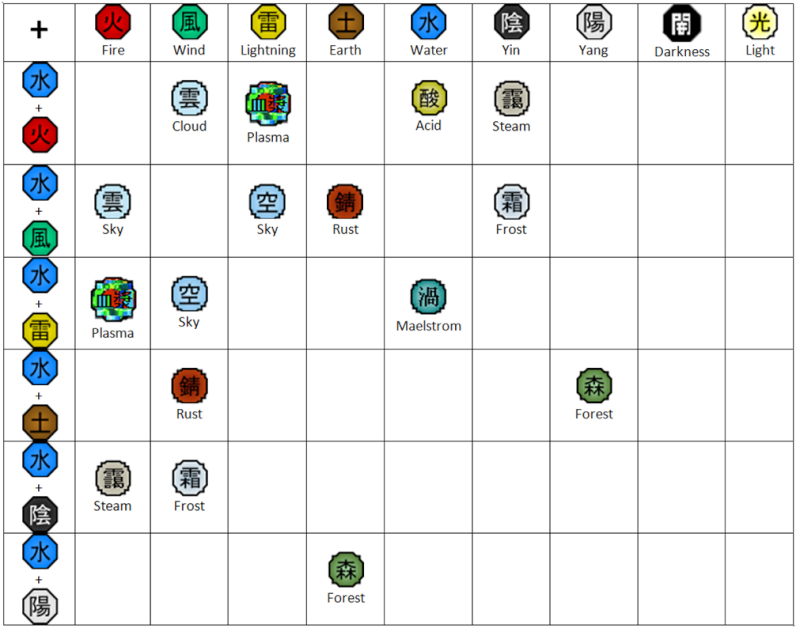 Clan elements do not count towards your overall element count. Fire Release (火遁) is one of the basic elemental nature transformations. It is performed by moulding superheated chakra inside the stomach before releasing it via the lungs and mouth. There are also variants to this in the form of some mediums such as the use of gun powder, explosive tags and chakra flow into a weapon. Commonly affiliated with the Tiger hand seal, Fire Release consists of mid to long-ranged offensive techniques that cause combustive and explosive damage. The chakra nature is common among shinobi of Konohagakure in the Land of Fire, notably with the Sarutobi clan and Uchiha clan, the latter having been noted to hold a natural affinity for it. Amaterasu, a power only acquired through wielding the Mangekyō Sharingan is stated to be the highest level of fire nature transformation. 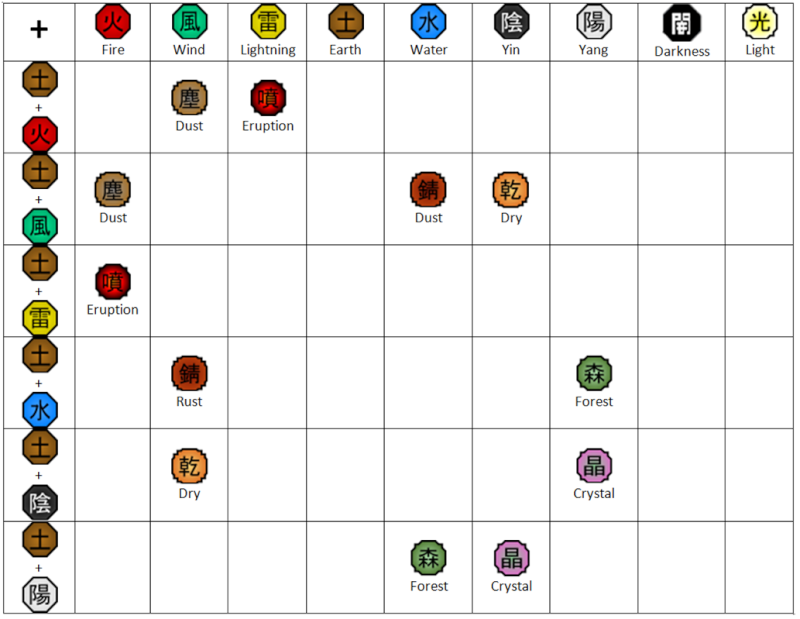 Wind Release (風遁) is one of the five basic elemental nature transformations. It is performed by making chakra as sharp and thin as possible. Wind Release is mainly short to mid-ranged offensive techniques that combine brute force and keen precision to deal cutting and slashing damage. A rarity among the five chakra natures, wind techniques are usually performed by generating air circulation and can be enhanced through this method as well. Wind-natured chakra can also be channelled into blades to increase their cutting power and overall range. 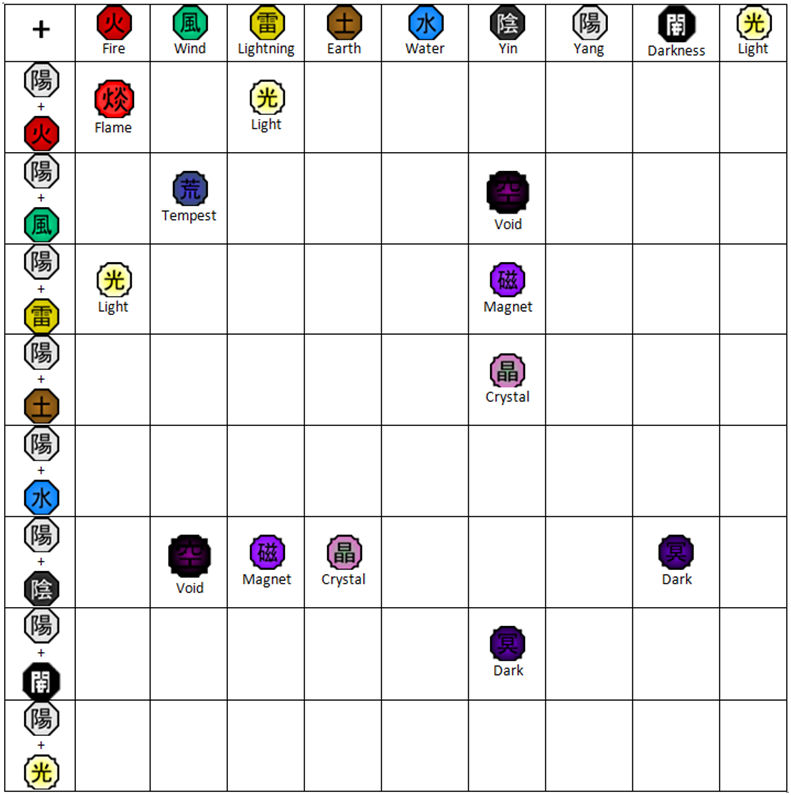 Lightning Release (雷遁) is one of the five basic elemental nature transformation techniques that allows the user to generate lightning by increasing the high frequency vibrations of their chakra, allowing for piercing damage and fast movement. The electricity paralyses the target so that they are unable to move and leave them vulnerable to a finishing strike. While uncommon, lightning can be infused into bladed weapons in a way similar to Wind Release through chakra flow for increased piercing power through vibrations, with the added effect of inducing numbness. When the technique is released from their bodies, and thus not requiring physical contact, it does not move as fast as true lightning. Instead, due to the control the user has to exert over it, it moves far slower, which can give opponents time to still react. Lightning Release is common to the ninja of Kumogakure. Earth Release (土遁) is one of the basic elemental nature transformation techniques and allow the user to manipulate the surrounding earth for offensive and defensive purposes or create it; be it dirt, mud, or rock. Earth Release techniques have the ability to change the strength and composition of the earth from being as hard as metal to as soft as clay, as well as manipulating their density, making them heavier or lighter. This includes allowing the user to travel through ground and rock in various ways which can be essential for both transportation and for setting up attacks or creating defences or for offence. Indeed, this makes earth techniques one of the most versatile of the elemental techniques. Pre-existing earth is not necessary though, for the user can create it with their own chakra. Earth Release affinities are the most common among the ninja of Iwagakure, and is commonly affiliated with the Snake seal and/or slamming their palm onto the ground. Darkness Release (闇遁) is a powerful Element gifted as a basic element to the container of the Juubi while it is an advanced element for the members of the Kurayami no Kengen clan as well as Shinobi who have learnt to combine the necessary elements together as well as taking a sample of the Juubi's chakra. The yamiton is an element that lives on death possessing the ability to take life. The Yamiton is a powerful element that can only be matched by the power of Hikariton or Light release. the Darkness Release is able to draw in negative emotions and energy gathering them into ones body or mouth and launching destructive beams or large spheres that tear the earth apart. Inton and Yohton with the added effect of the dark chakra of the Juubi are utilised in combing for the advanced element version of the Yamiton. 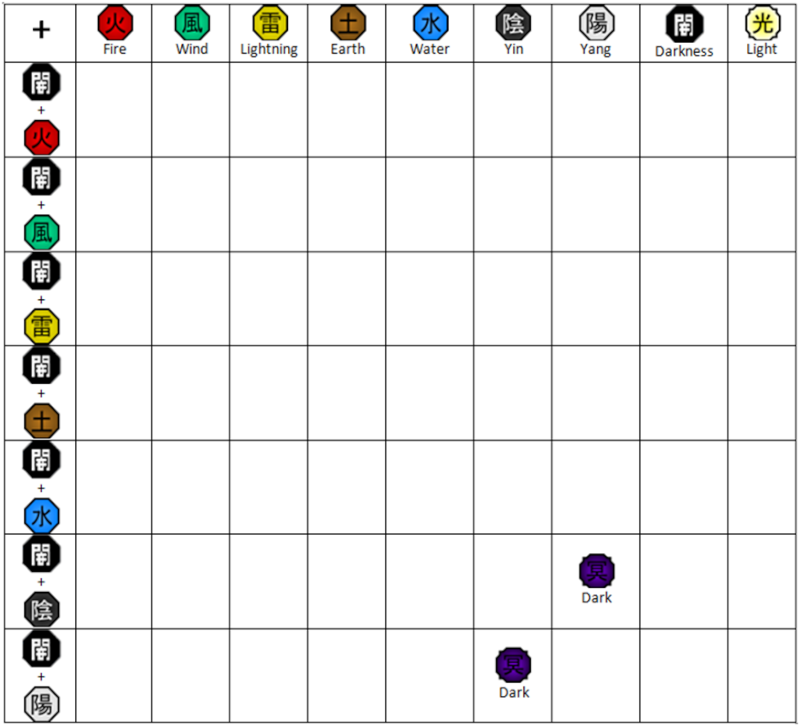 By combining the three Inton for imagination, Yohton for creation and the Juubi's dark chakra it gives the user the ability to possess and use the Darkness Element. The Yamiton by using it allows one to create a thick black veil of chakra around them manipulating the chakra to form around their body and create unique weaponry to create a diverse arsenal of techniques even manipulate it around an arm to create deadly claws. The Yamiton is also used by gathering negative chakra and the yamiton element together to fire off powerful black beams similar but weaker to a Bijuu dama. 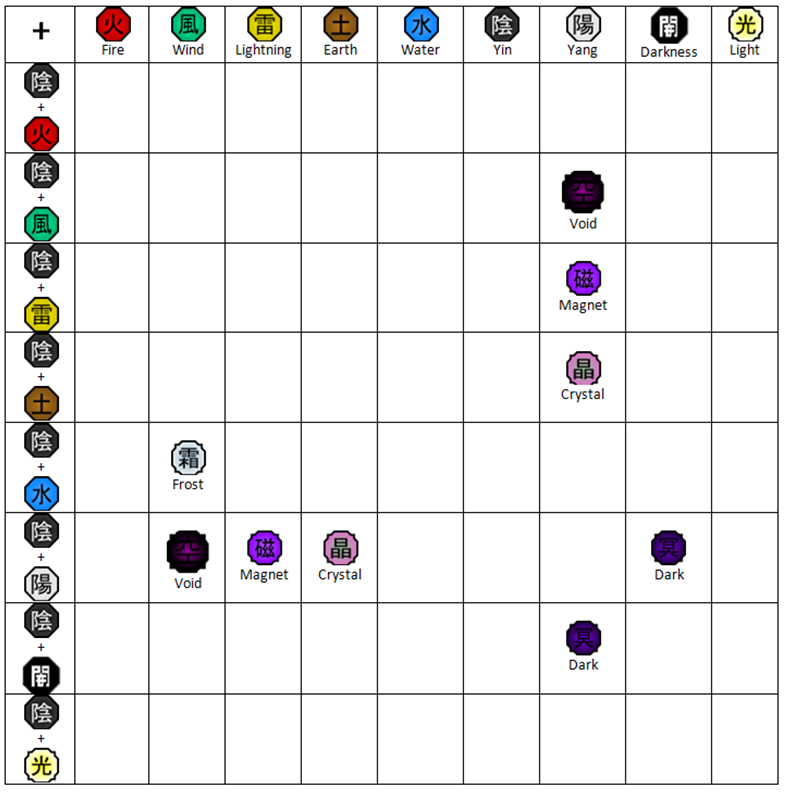 To utilise the Yamiton one needs high levels of chakra and control as the element can be quite consuming of ones chakra reserves but without a high level of control can not properly wield it. By releasing the dark veil around ones body a Yamiton user can release a strange black mist from the pours of their body which gathers into the air blackening out the light as dark veils cover the land. The mist can be manipulated and turned solid to be utilised in their darkness techniques. The Yamiton enables a user to even manipulate surrounding shadows bringing them to life or even step into the shadows and travel through them. As the Yamiton is the polar opposite to the Hikariton it can be defeated by a user of the light release yet the Yamiton can also beat a user of the light release if strong enough or more experienced. Light Release (光遁) is an advanced Kekkei Tota used by joining together Fire, Lightning and Yang Release to create to create, control, transform and manipulate into light. 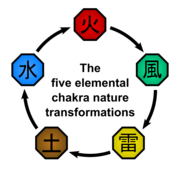 The Hikariton is used by combining Lightning and Fire nature chakra together mixing and entwining them before adding in the Yang element in order to control, shape and manipulate any source of natural light, mainly sunlight, starlight, moonlight and bioluminescence. 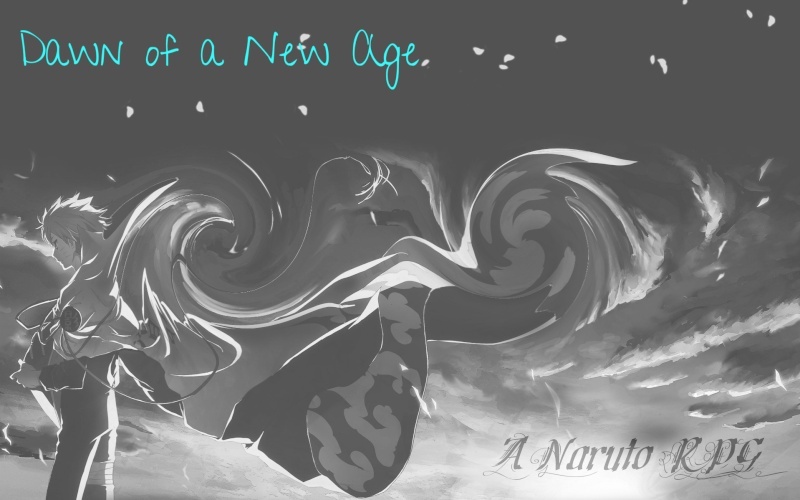 By gathering the light with their Hikariton they can channel it manipulating it into an array of Ninjutsu. Hikariton is a natural polar opposite to the Yamiton or Darkness release and are equal to one another in strength. Through the manipulation of the Light Element one can gather light particles shaping them into a variety of weapons, animals, high pressurised beams and a vast array of other Jutsu. The Yin Release (陰遁) techniques, based on the spiritual energy that governs the imagination, can be used to create form out of nothingness. When combined with Yang Release, it allows the use of Yin–Yang Release. The Yang Release (陽遁) techniques, based on the physical energy that governs vitality, can be used to breathe life into form. When combined with Yin Release, it allows the use of Yin–Yang Release. The Yin–Yang Release (陰陽遁) techniques make simultaneous use of Yin Release and Yang Release. 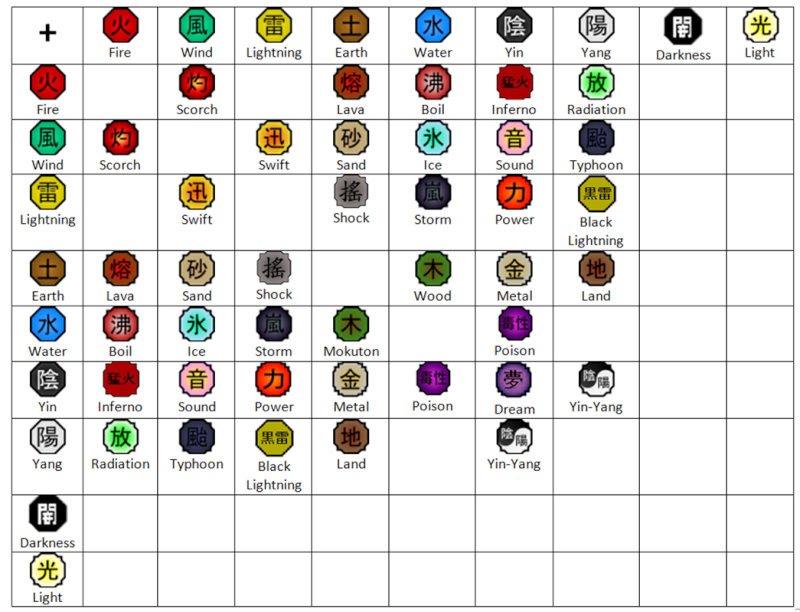 Yin relates to one's spiritual energy and Yang relates to one's physical energy and it's necessary to utilise both of these in order to mould chakra for ninjutsu. According to Yamato, the manipulation of Yin and Yang is the source of non-elemental techniques such as the Shadow Imitation Technique, Multi-Size Technique, medical ninjutsu, genjutsu, etc. Scorch Release (灼遁) is an advanced chakra nature kekkei genkai. This nature creates chakra that is capable of heating up an enemy to the point where all the liquid inside their body evaporates, killing the victim and leaving them a desiccated corpse. It is unknown what elements this nature entails. Implosion Release (縮遁, Shukuton) techniques are ninjutsu where by combining fire, lightning, Yin and Yang nature chakra together manipulating the two as explosive elements however unlike an explosion, in which energy radiates away from the source, in an implosion is released, where the object collapses upon itself, as a result of being crushed by an outside force. Lava Release (熔遁) is an advanced nature kekkei genkai that combines fire and earth-based chakra to create lava and related substances that can serve multi-faceted purposes. The Youton can be used to form molten rock, quicklime a corrosive substance, vulcanised rubber and more. Boil Release (沸遁) is one of the two advanced nature kekkei genkai of the Terumī clan and is made up of techniques that combine fire and water-based chakra to create a powerful corrosive vapour capable of melting anything. The user is also able to control the range and level of the vapour's acidity. Inferno Release (猛火遁) is an advanced element and a higher form of fire manipulation by combining fire with the yin release. By adding the two together ones flames darken in colour becoming a dark red increasing in size with an uncontrolled rage. The Inferno Release is connected directly to the users emotions and the angrier the wielder becomes the stronger their flames become. Radiation Release (放遁) is a form of advanced element manipulation that combines fire with the life breathing element of yang. Fire Release deals with the product of combustion. Empowering such process with the life energy of Yang Release resulting in a highly exothermic process, that being radioactive decay. Radiation Release can be used to produce extreme heat, as well as ionizing radiation, potentially causing radiation poisoning. The Swift Release (迅遁) is an advanced nature kekkei genkai that can be used to move at virtually instantaneous speed, granting the user an advantage over opponents with more strength than speed, such as users of Chakra Enhanced Strength. This nature therefore renders the user invulnerable against most taijutsu. It is unknown what elements this nature entails. Sand Release (砂遁) is an element comprised of earth and wind. By using the wind element the wielder uses it to break down the material and molecules of the earth crushing them into sand using their earth element to help manipulate the new sand that has formed. Once the sand has been formed it can be poured into the earth to break apart more materials gathering the strongest into the sand increasing its size allowing one to completely change the surrounding landscape into a desert. Sunaton however is highly weak to water as it mixes the molecules together creating large wet clumps decreasing the speed of the sand and make it fall apart, when fire is used against the sand it super heats it turning it to glass. Ice Release (氷遁,) is an advanced chakra manipulation which allows users to combine wind and water-based chakra to create ice, which they can manipulate through willpower alone. The ice created is largely immune to fire-based attacks, only melting slightly when coming into contact with flames. Through this bloodline, they can manipulate their water nature with unnaturally cold temperatures stored in their chakra. This form of ice is strong enough to rival even a diamond in durability. Sound Release (音遁) are offensive-type techniques that allow the user to to manipulate their yin and wind nature together to create a release allowing one to manipulate sound and soundwaves to their whim. By using yin release one can create and manipulate the surrounding molecules in the wind to create a variety of different noises and by infusing with wind chakra can project these sound waves and even enhance their volume with wind. Typhoon Release (颶風遁) jutsu are techniques that combine wind and yang-based chakra to create powerful wind currents that are capable of destroying almost anything in its path. The Typhoon Release is an advanced chakra nature which has its origins from the Wind Release. Typhoon release jutsu are mainly used for offensive type combat and like its original counterpart the wind release the user is able to manipulate wind to a much higher degree. Though unlike the wind chakra element the typhoon element isn't as easy to manipulate and shape into a form as its counterpart is, meaning it requires greater concentration and chakra manipulation in order to shape typhoon elemental chakra. There are several ways of utilizing the typhoon release, the user can blow air from their mouth which is the most common method of using wind release jutsu, the same principles are applied to Typhoon, or the user can use objects to move or control air currents which is also an effective method. Storm Release (嵐遁) is an advanced nature kekkei genkai that combines lightning and water-based chakra to create energy beams that can be guided towards the enemy. 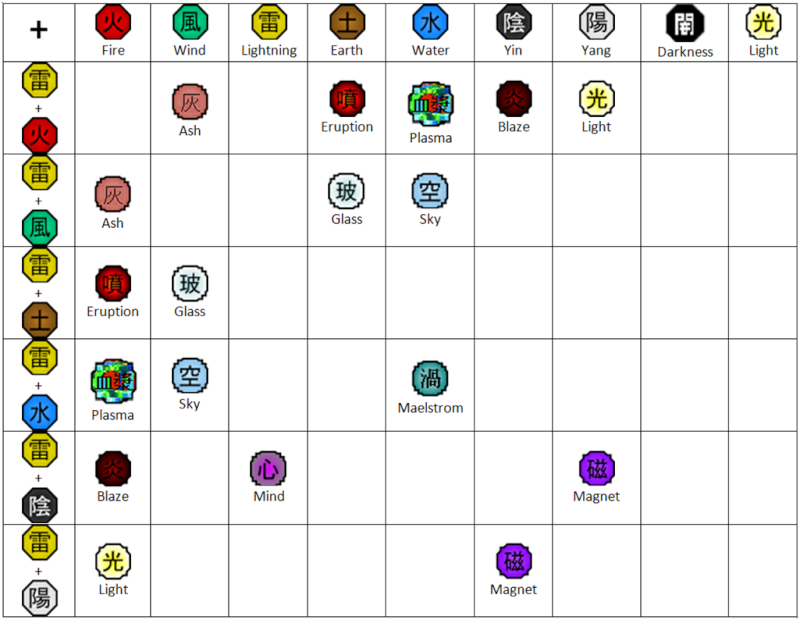 Magnet Release (磁遁) is an advanced chakra nature kekkei genkai which allows the user to convert chakra into magnetic forces and magnetise an object. Jiton can also be used to magnetise objects that when they come into contact with any other object, it causes the struck target to become magnetised. One hit to the body will cause a magnetic field within the said body, making it an easy target for any further magnetised weapons to be drawn to it. However, each time the magnetism is transferred, it weakens. Other's have also been able to use their magnet style in a similar manner as the sand release. The Magnet Release uses Lightning Release, Yin Release and Yang Release combined together making the Jiton a Kekkie Tota. Forest Release (森遁) is an element that is combined from Water, Yang and Earth nature chakra. The Gobi turns its vessels natural element into water and earth to suit the ability to form Shinton. The Shinton or Forest element allows for the usage of controlling the nature creating plants and trees nearby. Ones control over the Shinton is even superior to the Mokuton capable of creating large forests within seconds with minimal chakra. The Shinton allows the wielder to even manipulate the gene strand of plants changing and mutating them to create new breeds even sentient plants.